Whenever I do my lunchbox workshops, one of the big concerns I hear from parents is about food safety. Food safety is crucial, however don’t let this concern overshadow the need to pack real food in the lunch box. When you move from lots of packets and processed food to homemade food, you need to make sure you are following some basic food safety rules. If you follow the guidelines below, you can pack real food and not make your child sick! 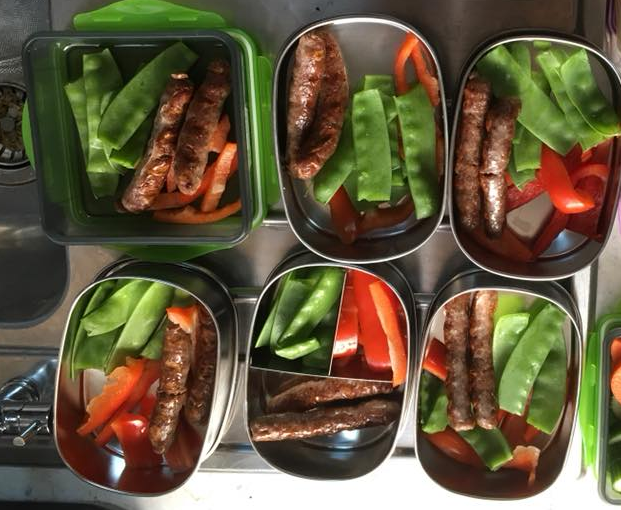 My eldest is now in Year 6 and has always has meat or fish in her lunch box, and we have never once had an issue. We live in NSW, so not the hottest part of the country, but not the coolest either. Wash your hands with soap and water. Just washing your hands before eating and preparing food can cut down the risk of infection dramatically. Don’t use antibacterial hand wash or hand sanitizer, as these as bad for your gut health. If you are chopping up raw meat when you are preparing the lunch, wash your hands again after you do this task. I find it really helpful to use a red chopping board for raw meat, and I never cut veggies on it. This reduces the risk of cross contamination. Chopping boards can really harbour bacteria, so make sure they are thoroughly cleaned with hot water and environmentally friendly detergent, or some essential oils. Wash your dishcloth regularly, so it isn’t full of bacteria also. If you like to keep raw meat in the freezer take it out the day before you need it, so you can defrost it in the fridge, instead of on the kitchen counter. If you keep your raw meat in the fridge, store it at the bottom of the fridge so it can’t drip on anything. Don’t have your fridge full to the brim, or the cold air won’t be able to circulate, and there will be pockets of warmer air. The things you keep in the doors of the fridge get more temperature fluctuations, so never keep something like meat in the door of the fridge. No matter how often I clean out my fridge, I always manage to find something out of date. Make sure you give any sauces or condiments a check once a month, and check things like meat or vegetables very frequently. I typically pack three containers for my children. I know bento boxes are incredibly Instagram friendly, however they don’t work with the way our school does food breaks. They also get a piece of whole fruit, usually an apple. The separate containers means they can just take the food with them that they need. For instance when they get to school and put their bags away, they take their sip and crunch (the little box of veggies) and put it on their desk. When they go outside for recess, they just take the other small container of fruit with them. All this food goes into an insulated lunch bag, with an ice brick. If it is particularly hot, you can pack 2 ice bricks, one below the food and one above the food. I NEVER make lunch on the morning of school. On a Sunday night, I make for Monday and Tuesday. This means the containers and the food are cold when they go into the lunch bag. You aren’t trying to use an ice brick to cool room temperature food, just trying to maintain temperature. Pack the lunch as late as you can. If you get up a long time before the kids need to leave for school, make packing the lunches one of the last things you do. Always check if your child has access to a fridge, as this can occasionally happen, and means you don’t need the ice brick. Teach your child to wash their hands with soap before meals, or at least make sure they do a good job washing after they go to the toilet. The bottom line is, you do not need to rely on processed food in the lunch box, and don’t let the fear of food poisoning force you to. Take adequate hygiene measures at home, use an insulated ice back with 1 or 2 ice bricks, and pack the food cold. the actual sizes of the stainless steel lunch boxes mention above and also where to source them? Thanks again, very helpful article.